Going gender-neutral. March. 17, 2018 07:33. mskoh119@donga.com. Moschino Barbie, a Mattel’s collaboration with the Italian luxury fashion brand Moschino, drew huge attention in 2015 with a new commercial that featured a little boy playing with the Barbie doll for the first time. It showed a gender-neutral perspective became important in the world of toy marketing. The barriers of traditional gender stereotypes are now being broken. The fashion industry has taken the lead in breaking gender boundaries with the genderless look for this year’s fashion trend. Gucci last year featured a male model in suits covered with floral prints and embroideries. A fast fashion brand launched a “ungendered” collection, a line of unisex clothing that both men and women wear the same items. Unisex restrooms are added in more than 150 universities and colleges in the United States. They also appeared in Korea, infamous for hidden camera placed in public restrooms, opinions split over the adoption, though. Schools uniforms are going gender neutral, too. The very first genderless uniform came out in Japan where most students in primary and secondary schools wear school uniforms – boys wearing stand collar jacket and trousers, and girls wearing a sailor blouse and short skirt. In a bid to break gender stereotypes and out of consideration for LGBT students, a new junior high school scheduled to open in April in Kashiwa City, will allow its students to wear whatever uniforms they want and choose between “tie and ribbon” and “trousers and skirts,” which means boys can wear skirts if they want to. 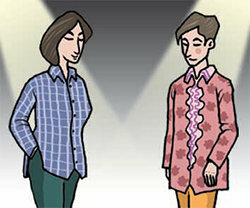 Traditional gender conformity is being challenged in many ways. Harvard University has been allowing new students to choose pronouns they want to be called for three years, providing options such as not only “he” or “she” but also neutral pronouns of “ze,” “e” and “they.” In London, the “ladies and gentlemen” announcement on the underground has been replaced with gender-neutral “Hello, everyone.” Last month, Canada finalized its legislative procedure to change the line of its national anthem. Canada will have a new line “all of us” instead of “all thy sons.” We cannot deny this trend any more in Korea. Now the time has come for us to follow the tides of going gender-neutral.